It seems that this year lots of game developers follow the popular tradition to postpone the projects’ or demos‘ release dates. And Konami company, unfortunately, hasn’t become an exception. Thus, yesterday, it became known that PES 2015 demo will begin a bit later in some countries. According to the official project’s site, PES 2015 demo started yesterday - on the 17th of September - on PS3 and PS4 in Asia, and today the owners of Xbox One will be able to try out the next instalment in this football simulator. There are also some changes in the dates, when PES 2015 demo testing will be held in NA and Europe. According to the official information, the citizens of North America will be able to test the game on PS3, PS4, Xbox One and Xbox 360 already on the 23rd of September. As for Europe, there is no exact date when PES 2015 demo begins in this continent, but Konami has promised to reveal this information in the nearest future. So, we just can hope that soon we’ll also be able to evaluate the pros and cons of the upcoming Pro Evolution Soccer 2015. But today we’d also like to rejoice you a bit. Regardless the fact that so far we can’t test the new instalment in Pro Evolution Soccer series, we can watch and show you how this cool project looks like for the current moment thanks to the fresh PES 2015 gameplay video. This footage is captured from the PS4 version of the game, and it shows us a very exciting play of two football clubs - Bayern and Barcelona. 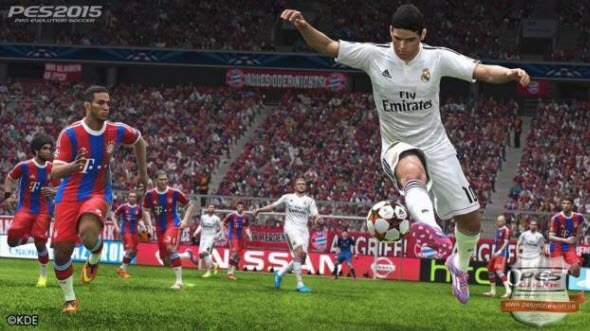 So don’t waste your time and watch this interesting PES 2015 gameplay video right now. And what do you think about these fresh PES 2015 news? Did you like the video? Let us know in the appropriate section below.